I’ve created this sample juice fast plan for those curious about juice fasting. Often times I get asked how much juice one should drink on a juice fast. The answer is to drink as much so you’re not hungry. Whenever you feel the urge to want to eat, drink some juice or water. Generally 3 quart of juice a day will suffice and is the minimum. Below is a sample juice fast plan for one day, this is what I will be drinking today, since its very hot here. Not shown in the picture is water, that’s also important to have on a juice fast, I’ll have about 2 quarts of water today. Seasonal juice fasting is beneficial to the body; we are all exposed to pollutants, toxins and harmful chemicals daily, fasting helps cleanse and detoxify the body. Juice fasting helps rebuild and rejuvenate cells throughout the body. Juice fasting also offers a blast of live natural nutrients, minerals, vitamins & enzymes to allow the body to regenerate and heal itself. These are just some of the many benefits of juice fasting. A successful juice fast plan will require preplanned recipes depending on the duration of your fast. I will write up a more thorough article and include recipes for future juice fasting. A tip on juice fasting is to not consume high amounts of fruit juices. Pure fruit juices offer a concentrated blast of sugar to the blood stream, this is especially important for diabetics. Instead try green juices and other vegetable juices which you can sweeten up with fruit when fasting. What is the typical output in oz of your juice recipes? Are they one serving, two, etc? I know so of it depends on the size of what you are juicing, just curious as both my husband and I enjoy green juices so I am wanting to figure out recipes that make enough for 2 of us. Thanks! Great website! Some recipes vary from 16 to 32oz. 16oz = 1 serving. I am doing a 30 day fast from meat beginning with a 7 day juice fast starting tomorrow(Sunday Jan. 6th 2013). Followed by a raw/vegan diet for about 3 weeks. I’m very happy to have found your article/site and can’t wait to learn more. I will be trying your juice recipes in more or less a smoothie form as I do not own a juicer and probably wont be purchasing one until after my bday April. I was wondering if you could provide any tips and or portion sizes as I am on a limited budget and don’t want to over or under spend…Thanks in advance. I look forward to sharing my results! Patrice, I would to hear how your 30 day fast goes. Please update me. All my recipes are in juice form, so you can cut them by more than half to 3/4 to make it in smoothie form. You’ll have to play around with quantity and make some adjustments for your taste. Try to shoot for a quart (32oz) of green smoothie a day. Here’s is what I may do. Add a cup of liquid (water, coconut water or nut milk), 2-3 handful of greens (your choice, always rotate greens, variety is key), Fruit of your choice like a cup of berries and a pear or cup of pineapple and a pear. Experiment and find what works of you. If you have additional questions, join the email list and send me a message. Is 1 Tbl. blue-green algae and 32 oz. of water a juice in itself? I bought some after hearing of its nutritional qualities but it’s fairly unpleasant smelling and tasting. The recommended serving is 1/4 tsp., and I try to disguise that in hot tea. Also, can the blu-green algae simply be added to any juice recipe to increase the nutrients? Eileen, its more of an enhanced water than a juice, however you can add whatever the recommended dosage to a juice for added nutrients. That should help mask the taste if you don’t like it alone. I just found this site. Thank you for your hard work Mariam. Joella, I see it’s been about a month since your post. I hope you have continued to juice. Several years ago I bought my Omega juicer eager to change my life with juicing. I started with a recipe similar to the one you posted and was so disgusted I didn’t use my juicer for another year. 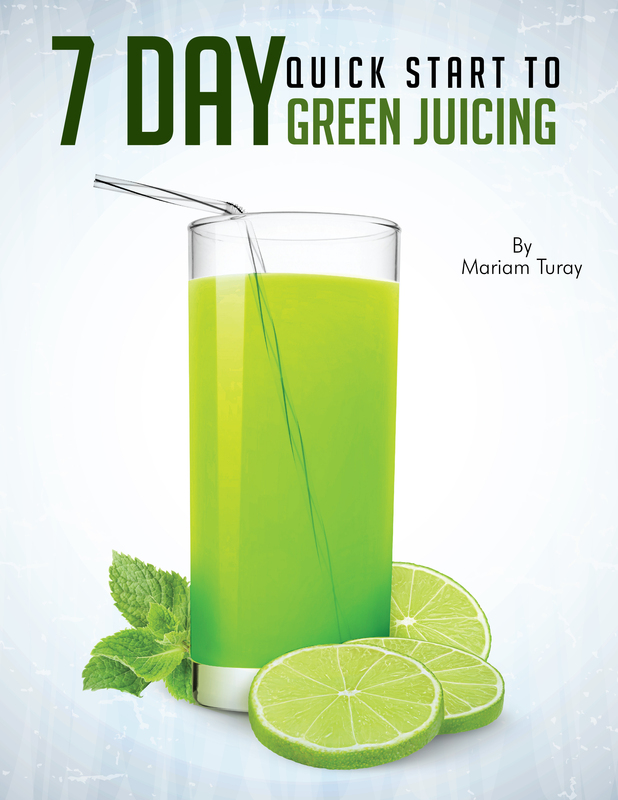 After regaining interest and reading some more, I did as Mariam suggests here and started with basic recipes of carrot, cucumber and apple androtated in various other things. It took little time for my palate to adjust and before long I was back to drinking very green juices without a problem. Stick with it. Your palate will adjust. Awesome site Mariam! I am brand new to juicing and I am overwhelmed with all the recipes and what to drink that tastes good. I have tried 6 kale, 2 beets and the beet greens, 2 oranges and a cucumber and I had a hard time getting it down. I want to be healthy and lose weight but I have to be able to like what I drink or I know I will not stick with it. I know I shouldn’t drink too much fruit so please help me out with some tasty recipes and anything else that will keep me motivated to get healthy and make juicing a part of my life. Thank you so much!! !